Missed Tuesday's season premiere episode of Counting On? It's available for free on the TLC website, and we have embedded it below for your convenience. The episode is also available for purchase on Amazon, iTunes, and Google Play. I cant see it, the box is white. I don't have cable TV so whatever I can see will be here on this blog. 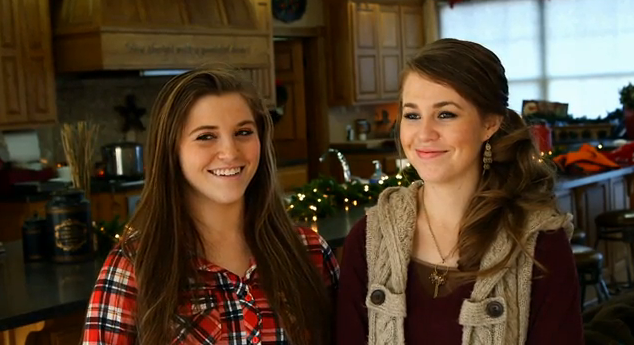 More importantly, I hope Josh and the parents and the rest of the Duggar family will be on the show again. That is what made the show in the first place, the WHOLE family! Let us all get over the past and forgive Josh and move on with life, just as everyone else is doing including his own family. Sadly it was just the same old thing. Jessa proving she still can't cook, the family being "shocked" that family size frozen food bags aren't big enough for their family, Anna the heart-broken but ever faithful wife...I think this show has run its course. I disagree. I'm glad to see that it's business as usual. I was hoping for EXACTLY that. It couldn't be that you have another agenda original poster...could it? I can't see it either. Stacey, Falkirk, UK. So disappointing! Not available in Europe AGAIN!! I have the same problem, would be very nice if we could see the show as well. Same here! All these videos aren't available outside the US... I can always watch the videos from UP TV (bates family), why not the videos from TLC?! Too bad! "At Home & Away is currently unavailable in Australia." Hi, the video you just embedded cannot be watched from France. The same message appears on the TLC site. It is sad to me to hear this family, especially the daughters, not just commend Anna but cast it as her choosing to face the pain and to continue walking through it. Turning away from an emotionally abusive and unfaithful spouse isn't ending pain or ending life, it's choosing a different path. Some would argue a more admirable one. I wish she would have turned to the cameras and said you know what, this stinks, I'm not coping with it well, and I'm pretty darn mad. Now that truthfulness would be something I'd admire. Yeah, but the Duggars are Christians and they are trying to be Christian in this case. Yes they are Christians. And since when are Christians not allowed to get angry because they have been abused? Forgive, yes. But get angry, allowed. Suffering through the pain she is walking through will only hurt her and her children in the long run. Yes it makes me sad too! Anyone can say what you said. It takes a woman of faith and character to respond the way Anna is responding. Anna is handling this like the Christian woman she is. I have doubts that I could ever walk through something like this, but she does it with love and grace, holding onto her faith tighter than ever just to get through it. She is amazing, and I hope I can be half the Christian woman she is someday. The Duggars do not define Christianity. There are plenty of followers of Christ who do not believe women must perm and curl their long hair, wear skirts, stand by theire double-life adulterous spouses, etc. They represent only their own unique beliefs. I think it is unfair to judge Anna for choosing to stay and work on the marriage. She is neither the first nor the last woman to stay through infidelity and no one can really know what that is like until they face it. Only Anna knows if she has the strength and the heart to love and forgive. If you truly support women having the right to decide what they want out of life then you should support Anna's choice. Anna, if you ever see this just know that there are lots of people out there who admire you and draw strength from you. You can still be a Christian and admit your mad about something, she almost giggles when she's interviewed about Josh. Anna needs counseling as well as Josh. I don't think she's being honest about how she really feels. Even Job tore his clothes and cursed the day he was born. It would not be unChristian for Anna to display some normal anger or despair. Everyone expresses themselves differently. I think Anna is a model of strength. It would have been just as "Christian" for Anna to have walked away from her lying, cheating husband. That, too, is Scriptural as adultery is grounds for divorce in the Bible. Let's not put her decision on a high moral ground...staying with an abuser isn't faith it is just a choice. If you watched the initial three shows, you saw Anna show that she was struggling. She also mentioned on this episode that they were BOTH getting help. To be honest though, from Anna's position,the best help that she can get is from her Savior,Jesus Christ,and that is just what she is doing. She has stated that things have been difficult, but have drawn her nearer to HIM who gives strength. Just because someone is showing strength in the face of adversity in no way gives anyone the right to assume that they are not'dealing with'the situation appropriately. The Bible says (in numerous places, I might add) that we should draw or strength from Him. I am so grateful that there are still examples of exactly that in our world today. Anna has shown strength . She is the only one who can decide what's best for her and her children. When we marry it is for better or for worst and in sickness and in health. Joshua has definitely fallen,but it doesn't mean he can't get back up. Some will say, I don't understand how she can stay with him. "Love" what you won't do, you'll do for Love. The saying is true. No one can judge Joshua and shouldn't. We don't know what went on after the camera's were off or when Anna first learned of the situation with her husband. It doesn't make her more christian to stay or less christian if she were to end her marriage. What I see is a couple making an effort and fighting for their marriage and family. This situation is nothing new and we all can learn from it. God Bless them all and I pray it works out. I misss the entire family. There's alot of Love in this family. They're going thru a storm and we can help them by rallying behind them showing our support. I'm so disappointed it's Not available in Canada. I would love to see it. I was the one at 9:02AM that couldn't see the video either. I went to tlc.com and was able to see the video. why can't we see it in Canada? Will you be adding more episodes on to the blog as they are aired? I am so thankful that the show is continuing in this format. I've watched these kids for years, and for it to have just suddenly ended, with all of that tragedy, would have felt like a personal loss. Great to see that all are coping! I though it might be slightly interesting, but no avail. I did'nt make it through the episode. OK, I am finished.The girls seem kind of fake, must be for the cameras. Not available in Australia of course waiting for it come up on your tube or something simular s i can watch :( Glad they are back and the others are comming in slowly , although no i dont want to see Josh and I doubt if TLC would allow as they would lose their show again. Will see what happens but excited to see updates now again. TLC, enough with the verbal gymnastics to avoid saying the word "Thanksgiving." Fall feast? Holiday meal? Give me a break! If this was a Jewish family celebrating Hannukah, I doubt they would be barred from using the word "Hannukah." Enough with the political correctness! Sheesh, could ANYBODY see it? I am very thankful the show is back! This is the only show on tv that I watched. I don't like all of the garbage out there. I am thankful for this family I may not ever meet this side of heaven. Anna is shining in the darkness of her situation. This family is walking the journey of life as we all are with their eyes on Christ. That is where my encouragement lies. Thank you Lord for their witness! Even in jars of clay like the rest of us! The ONLY show you ever watched...why???? may I ask why ONLY this show?? Seems rather odd to me and I'm sure to the other thousands of people who read this blog..
At Home & Away is currently unavailable in Croatia. Although I'm a huge advocate for Ben to do the cooking, I have to agree with you. I don't want eggs and yogurt every night either. It's currently unavailable in Australia right now. How much longer until its available?? I'm so glad they posted this! I don't have tlc so I was thrilled to get to watch it. The video did freeze up a lot and I had to keep on reloading it, but it was worthy it! Here's a super easy solution to watch from outside the US. Copy the video link fromt he TLC website, go to https://hide.me/en/proxy , select your country as USA and paste the link. Done! Make sure you select proxy location as USA, then click "visit anonymously". It should work fine from anywhere in the world. I'm so glad I got to watch them but I miss watching the whole entire family!Still happy I get to see some of them though.Love this family! I would love to know how the Duggars and Annas hair stays so healthy looking after using curling irons I use deep conditioner and heat protectant oil treatments and it gets damaged so easy.They all looked beautiful as always! It looks like they are playing something sunday at 8 not sure if it's a repeat of Tuesday or not?I think so though. Many people outside of the US are trying to watch it and having trouble.The ratings will be even higher!Yay!love them! Ben looks sad, and embarrassed. Poor guy. I really want to watch but I'm in Canada! When will it be available to me??? I'm trying in Botswana too, and can't see it.